These pontoon boat seats make up our Classic CRG1901 pontoon furniture set. do you have a 20 " bench seat? No. We only have the sizes available that are listed our websites. 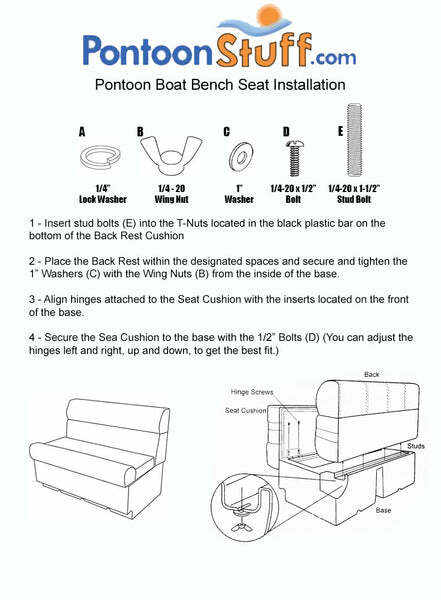 Unfortunately, we do not make custom sizes for our Pontoon Furniture either. Yes our pacakges are set you as convience for the customer and there is not a price break for buying a package. We list the seats that are included in the pacakge below in the description. You can simply add the seats into your cart indivually or give us a call and one of our represenatives will give you a hand. My boat has a sun deck across the back. Do you carry that piece? Unfortunately, we do not carry that specific part. We do however caryy the vinyl to match our seats and the previous sun deck reupholstered.